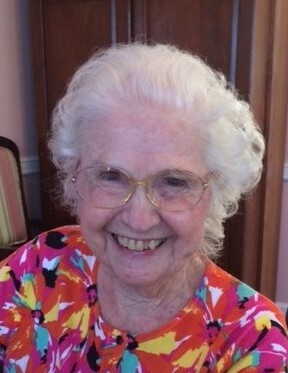 Juanita Abugel, age 94, of Dothan, passed away Saturday, November 24, 2018. Born on the family farm outside Dothan, she grew up and lived there until she went to Auburn to get her degree in home economics. Instead she found the love of her life, William, who she married and stayed with until his passing 68 years later. Juanita was a loving wife and the type of mother that Proverbs 30 is written about. She leaves behind her two sons, Bruce and Jeffrey; her grandson, Brian; her granddaughter, Stacy Lyn; two great-grandsons, Christopher and Jonathon; Jeffrey’s wife, Beverly; her brother, Morris Stringer and wife, Gloria, along with numerous nieces and nephews throughout the country. Funeral services will be held at 11 AM, Friday, November 30, 2018 from the Ward Wilson Funeral Home Chapel with Dr. Ricky Plummer officiating. Burial will follow in Gardens of Memory Cemetery. The family will receive friends from 6 PM until 8 PM, Thursday, November 29, 2018 at the funeral home.